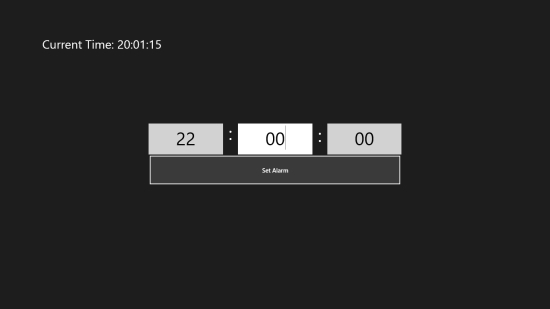 Crazy Timer is a free Windows 8 Alarm Clock app that rings at the time set by you. In this simple Alarm Clock app, you can manually set alarm and get notified by the crazy ringer. The app is appropriately called as ‘Crazy Ringer’ because the ringer of the alarm is very unusual and closely resembles Police siren. Also, the app’s screen starts behaving crazy by blinking red as soon as the alarm rings. 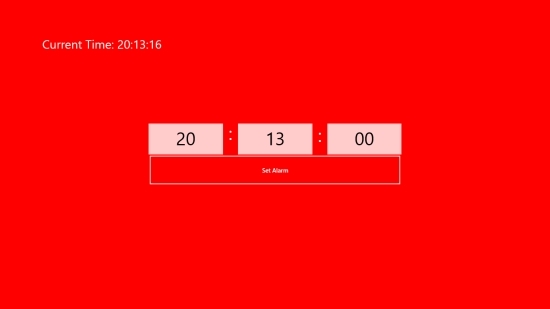 This free Windows 8 Alarm Clock app is a simple app with minimalistic interface. The app’s screen displays a digital clock that shows the current time. You can add an alarm, enter alarm time, and set alarm easily. Crazy Timer is freely available in Music & Video category of Windows Store. You can click on the link given below at the end to download it directly from Windows Store. Let’s see how this free Windows 8 Alarm Clock app works. As I mentioned, Crazy Ringer is an extremely simple app and easy to use. The main screen of the app will display a digital clock that will show current time in hours, minutes, and seconds. As you right click on the screen, the app’s bar will display Add option. Click Add option to add an alarm. Enter alarm time in the specified hour, minute, and second fields. Now, click on Set Alarm button displayed just below it. You alarm is set! As soon as the set alarm time is reached, the alarm will ring. The app’s screen will also blink red notifying you of the time. To terminate alarm, again right click on the screen. The app’s bar will display Stop button. Click on it to terminate the ringing alarm. Also try Alarm Clock HD and metroAlarm. Crazy Ringer is a simple Alarm Clock that rings at the set time with a crazy sound. However, the alarm will notify at the set time only if you are on the app’s screen. Give it a try and share your feedback via comments.